What Are Google Virtual Tours? Who is Fox Virtual Tours? Fox Virtual Tours embodies the creative vision and talent of of Brad Lawrence, an award-winning Google Trusted Photographer. 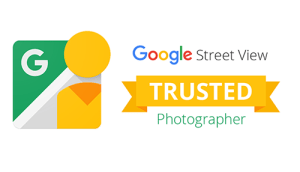 We are proud to be the leading provider of Google Street View Trusted Virtual Tours in the Fox Valley, serving Naperville, Aurora, the Tri-Cities and surrounding cities. Our online virtual tours bring your business to life on Google, your website, social media pages and more. What makes your business truly unique? With a Google Virtual Tour, customers can “See inside” and find out! Our 360-degree Google Street View Trusted business virtual tours are perfect for retail shops, dental clinics, restaurants, pubs, salons, spas, galleries, hotels and more. Google Virtual Tours engage new customers and double interest in your business listing, encouraging them to visit you in person! SHOWCASE YOUR BUSINESS ON GOOGLE SEARCH, GOOGLE MAPS, MAPS FOR MOBILE AND YOUR GOOGLE+ PAGE. EASILY EMBED YOUR GOOGLE VIRTUAL TOUR ON YOUR WEBSITE AND FACEBOOK PAGE. CLICK ON THE PREVIEWS BELOW TO SEE THE LATEST BUSINESSES WE HAVE ADDED TO GOOGLE STREET VIEW. IT’S SIMPLE, FAST AND AFFORDABLE!